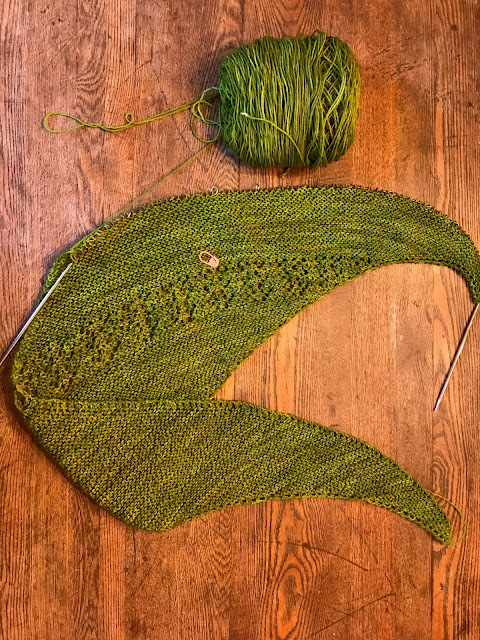 I had trouble concentrating on the lace pattern when I was sick and ended up frogging back to the garter stitch section, but as my mind has cleared, it has become easier. I'm just starting the second lace section now. I'll put in a lifeline after the next row. The yarn is Hedgehog Fibres Sock Yarn in "Swamp." It's hand-dyed. 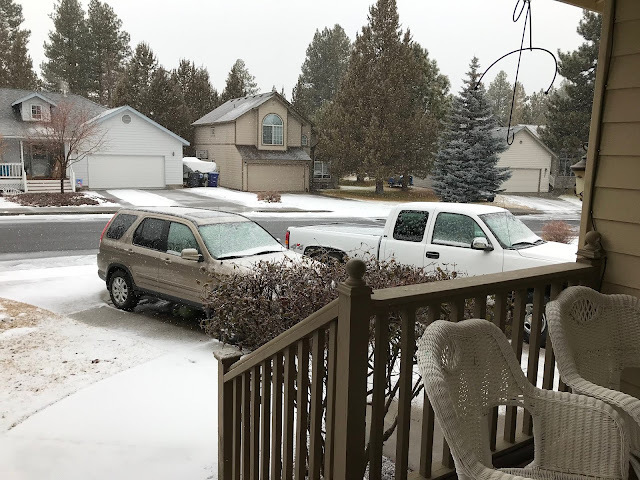 We had some more snow. This snow is typical for Bend. I'm so glad that if we had to get sick, at least we aren't contending with the usual Park City snow. DBIL is recovering well from his surgery. DH took him to the doctor on Friday, and he has been released from care. He can drive himself now, so that's good. 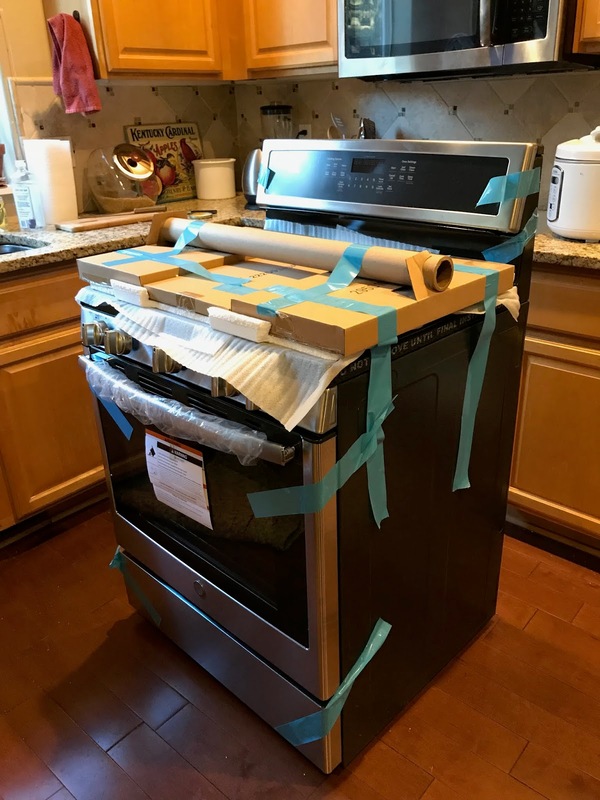 You may remember that we replaced all our major kitchen appliances during the Black Friday sale at Lowe's. 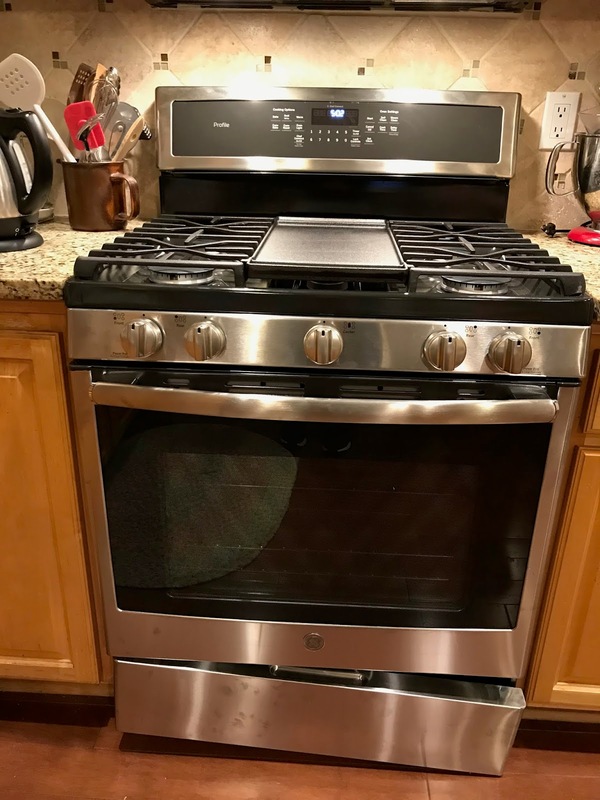 The stove was found to have three rivets missing, which caused the drawer to hang down on the right side. It was still useable for cooking, but we couldn't use the drawer. DH taped the drawer in place, and Lowe's ordered us a new one, which was delivered on Saturday. The first one had some scuffs on the control panel, too. This one is virtually pristine. Good for Lowe's. They made devoted customers out of us. The first thing we did when it arrived was check the drawer, which functions perfectly. DH picked up some stainless cleaner, and I cleaned the dishwasher with it yesterday. When we took out the old dishwasher, we discovered some wires had been chewed through by mice. One of the wires was for the dishwasher and the other went to the outlet at the end of the breakfast bar. If some motion in the house had caused them to touch, we could have had a fire. 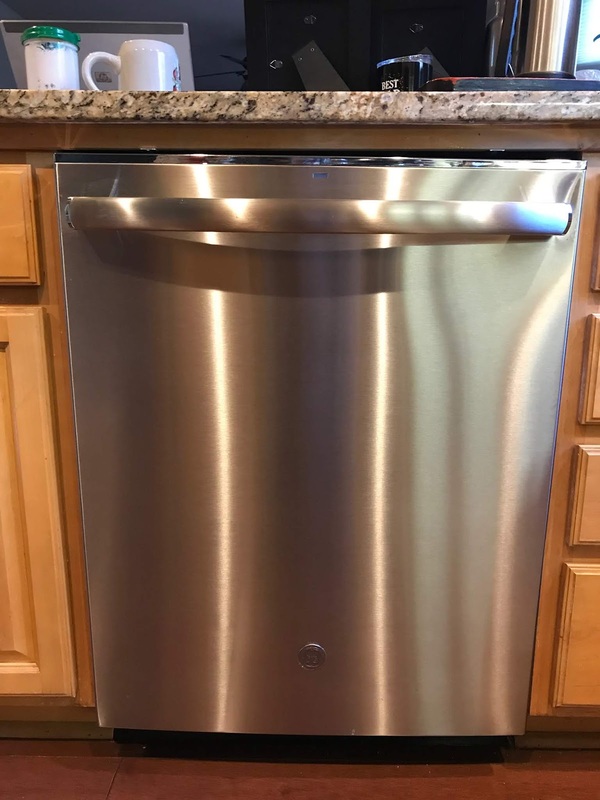 The electrician fixed the wires, and right after Christmas, the plumber came and installed the dishwasher, so we were able to use the dishwasher before everyone left. 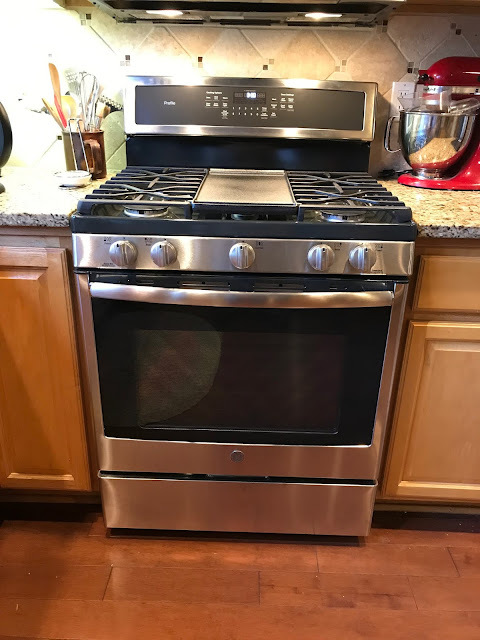 I didn't really want stainless appliances, but you have to pay extra for white now, and the microwave, which we haven't replaced, is stainless, so it was expedient. The stainless shows fingerprints, which I don't like, but it is what it is, and they are otherwise nice-looking appliances. The main thing is, they work well. I managed to do a photo shoot for Friday's story. Cooking Lesson gives children a basic overview of nutrition. Billy and Mariah come into the kitchen, where Jolena is cooking. They pepper her with questions about what you have to know when you cook for others. What's on my needles: Still the Nurmilintu Shawl. What's on my Sparrow 15: Standing by for costumes for my characters. 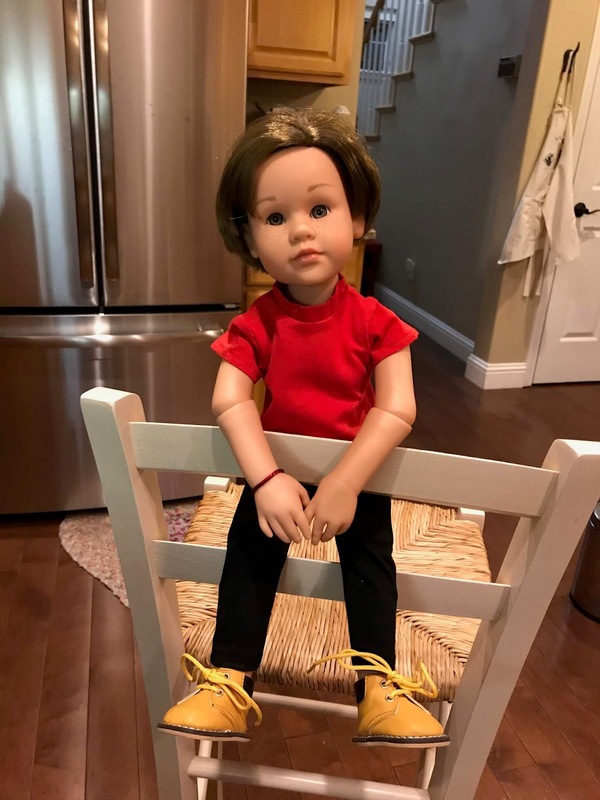 What's in The Doll's Storybook: Cooking Lesson. Jolena is in the kitchen. What's on my iPad/iPhone: Finished The Ladies of Ivy Cottage by Julie Klassen, and then listened to The Forbidden Door by Dean Koontz. Now I'm starting Fear by Bob Woodward. My DBIL has been reading it. He says it's good. What's in my wine glass: Nothing right now. I've lost my taste for wine. It will come back, I'm sure. What's my tip of the week: A pneumonia shot won't keep you from getting pneumonia, because it doesn't cover all the bacteria and viruses that can cause it. However, it can prevent many strains of pneumonia and, if you do get it, you are likely to recover faster. Good that you are improving. Hang in there. Thanks, ladies. I understand it takes a long time for the coughing to go away. That's my main problem right now. What a rough patch for you. Glad you are on the mend! Glad to hear you're feeling better Peggy. We're nowhere near settled, Irene. We still have fixtures to replace and boxes to unpack, and the rail between the kitchen eating area and the family room needs to be repaired and reinstalled. However, it does feel like home. I slept well last night. I had my nightly coughing fit before bedtime and then didn't cough again all night. I've definitely turned the corner. I'm glad you're feeling better Peggy. Winter illness can linger on. I love your stainless appliances. Very pretty. Sounds like you are pretty well settled in your new home. Rebecca, thanks for the tips. DH does most of our grocery shopping. I'll ask him to look for the wipes. The stainless cleaner we have is supposed to protect the surface, so I plan to do all the appliances, but it would be nice to have a little wipe for cleaning up spills and fingerprints between cleanings. Thanks for the tip about Robert Galbraith. I've heard that she has written under another name, but I couldn't remember what. I'll check Audible. I read all the Harry Potter novels (well, listened to them) and enjoyed them immensely, and we have all the movies.